Long long ago the mighty Teesta and Rangeet rivers were in full spate. The water level rose to such a great height that even the hills were drowned. Men, women, children, and animals were swept away by the flood. The Lepchas of the Tendong hill then began praying the God. They were so sincere in their prayer that the God was pleased and appeared before them as a large Kohomfo bird and began sprinkling chhang, a kind of millet beer, on the rivers. It had a miraculous effect. The moment the chhang drops fell on the rivers the level of water started receding rapidly. Soon the flood was over and the people returned to their homes and the divine bird flew back to heaven. 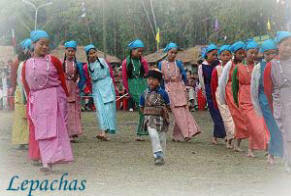 The Lepchas commemorate the event by worshiping, through dance the Tending hill which gave shelter to their forefathers at the time of great calamity. Both men and women participate in the dancing and the musical accompaniment is provided by Palit (flute), Tembak (string instrument), Tindar (drum), and Romu (cymbal).